A massive volcanic eruption around 1650 B.C. forced the centre of what was then a single island to implode and succumb to the sea. Some say that this was the original home of the lost city of Atlantis, which long ago disappeared into the ocean’s depths. Whatever remains of this mythological metropolis is now guarded by beautiful beaches and stately whitewashed homes. 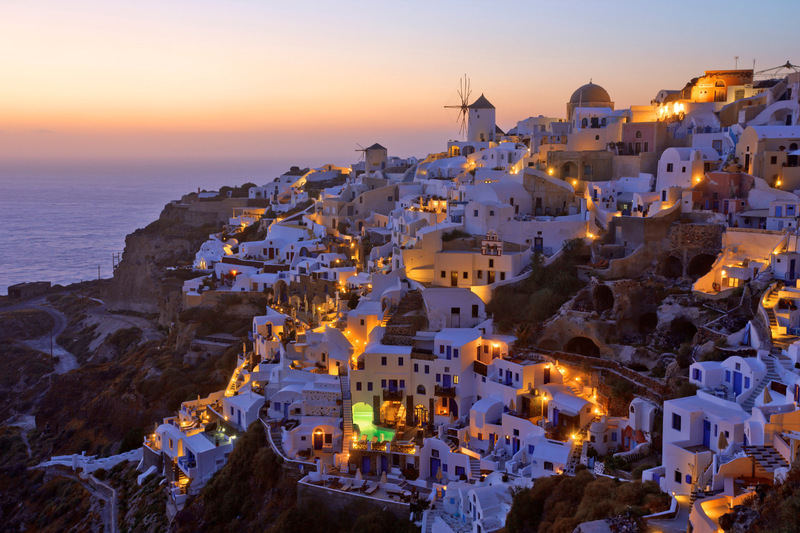 Today, Santorini consists of two inhabited islands and several islets. 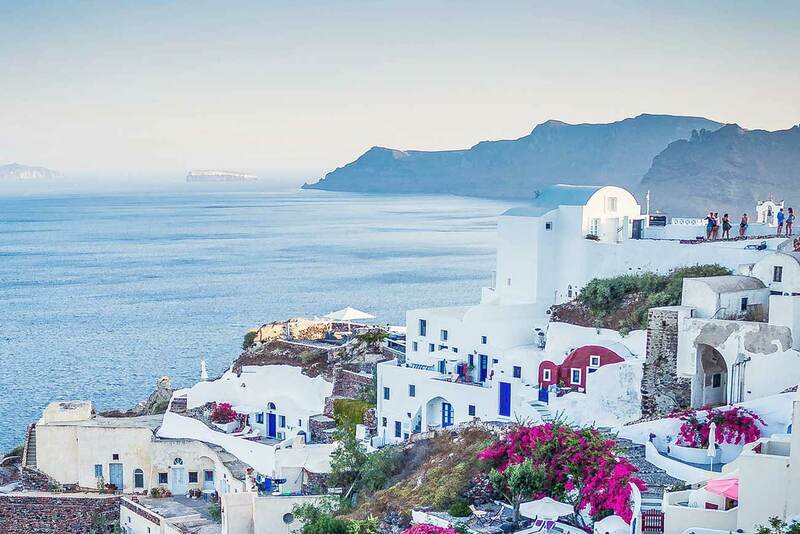 Most visitors spend their time on Thira (the archipelago’s largest island), which is home to Santorini’s major towns, including Fira and Oia. Sleepy Thirassia makes for a relaxing day trip too. And don’t count out the quieter islands: Nea Kameni and Palea Kameni are worth exploring. Your first order of business in Santorini is to hit the colourful beaches – the black and red sands make for a memorable visit. Next up, indulge in the archaeological delights of the impressively preserved Ancient Akrotiri or hike to Ancient Thera to see the ruins of three empires, including the Romans. From there, catch a breathtaking view of the caldera, a brilliant turquoise pool of water that serves as the nucleus for the varied isles of this archipelago. Some would say you only need a day to enjoy these islands’ charms (they are a popular port of call for cruise ships), but to really drink in all Santorini has to offer, you’ll need a few days to a week. Then you’ll have plenty of time to learn there’s more to these comely dots of the Cyclades than meets the eye. The best time to visit Santorini is from September to October and April to May when the weather is warm and the crowds are scarce. Like all of the Cyclades, Santorini welcomes the most visitors during the summer, so you’ll need to make your reservations months in advance if you plan on visiting anytime from June through August. Looking for a bargain? Try winter, when room rates tend to plummet. Keep in mind that this season’s average highs only reach the 50s (not good for sunbathing) and the region sees plenty of precipitation. However, all that rain does make for a very flowery (and warm) spring season. Crowds will be at a low in the spring as well, though tourists will begin invading the islands come May. Vacation in the shoulder seasons The fall and spring are known for warm weather, but not as many tourists take advantage of it compared to summer. You can find some great deals on hotels if you skirt the summer crowds. Hungry? Head inland While the thought of munching on fresh Greek fare beachfront or cliffside is no doubt tempting, these restaurants may charge higher prices solely for the location. Definitely, take advantage of these scenic restaurants, but balance it out by heading inland, where you’ll likely find more budget-friendly menus. 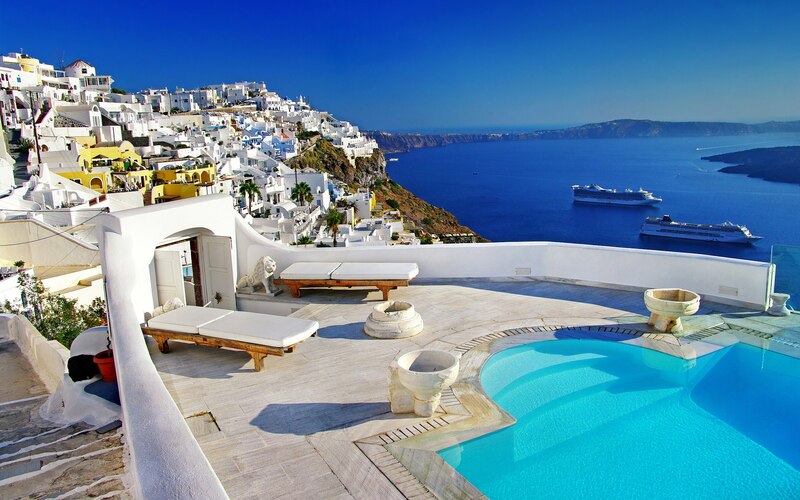 Stay on the east coast Hotels along the caldera in towns like the popular Oia tend to attract the most travellers, especially honeymooners. You’ll find much more reasonably priced rooms in southeastern towns like Kamari and Perissa. Greek is the official language, though considering the large influx of visitors the island receives (as many as 10,000 cruise ship tourists alone come ashore daily), you’re more likely to run into English-speaking Greeks than not, especially in tourist areas. Understanding body language here though is key. Be very aware of your gestures. For example, using the thumb and index finger to signal “OK” is offensive, as is holding up your palm to anyone. If you want to wave goodbye, make sure your palm is facing you. As for indicating nodding your head to indicate ‘yes’ and shaking your head to indicate ‘no.’ Greeks do it differently. A slight downward means ‘yes’ while a slight upward nod means ‘no.’ These gestures are often subtle and quick, making it hard for foreigners to understand. The best thing to do is avoid trying to communicate with gestures here to avoid getting lost in body language translation. Greeks are known to be very friendly, especially when meeting new people. When meeting a Greek in a social situation, shaking hands is customary. Two kisses, one exchanged on each cheek, is the norm when with acquaintances. Greeks tend to be very open and become deeply engaged when in conversation. They have also been known to get personal, fast. If you’re uncomfortable with the dialogue, such as talking about sensitive subjects such as politics or if you’re being asked too personal questions, simply try to change the subject. Lateness is also common here. If you have plans with Greeks, expect them to be at least 15 minutes late. Shorts and T-shirts are acceptable when walking around the towns or the beaches, some of which are clothing optional. Dress continues to be casual even in restaurants, but Greeks tend to dress up a little more nicely when dining out in the evenings. Other than on the beach, never waltz into a restaurant or public space in your bathing suit or barefoot, even along a beachfront promenade. Santorini’s currency is the euro. Since the euro to U.S. dollar exchange rate fluctuates, be sure to check what the current exchange rate is before you go. Major credit cards are accepted at most restaurants and shops. When eating at a restaurant, a service charge may be included. As such, tipping isn’t commonplace. Also, keep in mind the plumbing system in Santorini is not stellar – when at a hotel or restaurant, throw any used toilet paper in the wastebasket rather than flushing it down the toilet to avoid any potentially embarrassing flooding situations. While in Santorini, take full advantage of the fresh Greek fare. The island’s climate in combination with its volcanic soil enhance flavours of the fruits and vegetables grown here. As such, Santorini has made a name for itself in the wine community, making a visit to one of the island’s wineries a top attraction. In addition to delectable grapes, make sure cherry tomatoes (especially sun-dried), capers and white eggplant are part of one or more of your meals during your time in Santorini. The sweetness and white colour of the eggplants here are a direct result of being grown in volcanic soil. Cherry tomatoes are another fruit that can attribute their taste to the unique soil. If you like eggplant, then you’ll no doubt enjoy moussaka, a Greek-style lasagna that features layered eggplant, minced meat, fixins and spices topped with béchamel sauce. Other must-try Greek specialities include anything with olives and olive oil, especially a traditional Greek salad, as well as fava, a traditional dip made of fava bean puree. Greeks are all about their dips. Along with fava and the famous tzatziki sauce (yoghurt, cucumber and garlic), another must-try and uber-traditional dip is taramasalata, made from smoked fish roe and mixed with olive oil and lemon juice. Other popular small bites include dolmades and keftedes. Regularly served before meals, dolmades are seasoned rice often mixed with meat or vegetables and wrapped entirely in a grape or vine leaf. Keftedes is fritters commonly mixed with cherry tomatoes (tomatokeftedes) or grated zucchini (kolokithokeftedes). If you’re after something heartier, you’re in luck: The island, as well as the whole of Greece, have a penchant for grilled meats. Souvlaki, or seasoned skewered meat, often topped with tzatziki, can be found all over. Octopus, which you’ll likely find hanging by its tentacles outside seaside tavernas, are also popular. And, of course, you can’t leave without grabbing a gyro. Whatever you choose to eat, make room for dessert – baklava, a filo pastry layered with honey and ground nuts and loukoumades, or deep-fried donut holes sprinkled with hot honey and cinnamon, are local favourites. You can find everything from quick gyros to casual eateries to upscale restaurants throughout Santorini. Head to Restaurant 1800 in Oia for fine dining and expertly presented Mediterranean cuisine. If you can, snag a table on the roof to enjoy sweeping views of the island’s cliffs. Selene is another upscale option, conveniently located in Pyrgros, which houses a number of wineries. In Fira, the hundreds-year-old Taverna Nikolas is as traditional as it gets, offering classic Greek dishes at affordable prices. For a little romance, enjoy a candle-lit dinner at the edge of the caldera at Ambrosia. 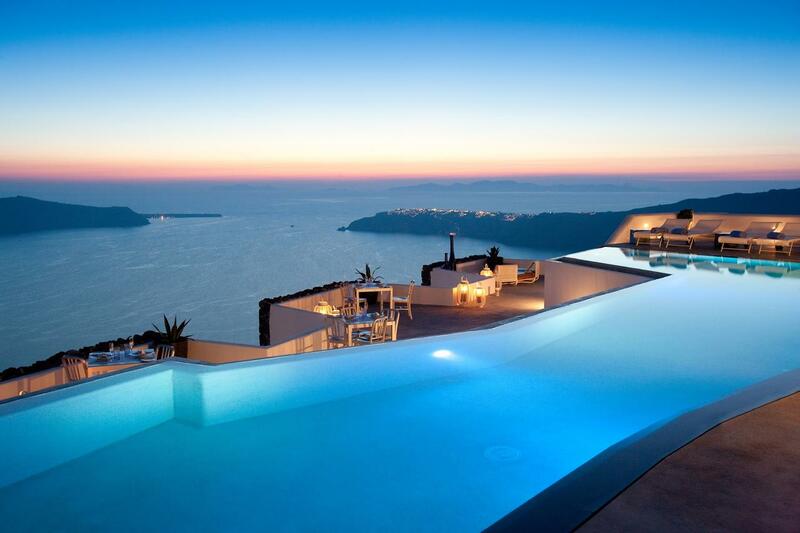 Santorini is pretty safe. Travellers report feeling comfortable walking around the streets both day and night. Even pickpocketing is few and far between here. In terms of getting around, there are not many sidewalks in Santorini, so be careful when walking the streets as you may need to dodge the occasional wayward, speedy scooter. Use caution when navigating Santorini’s beaches as well. Most of if not all of the beaches are composed of small rocks rather than sand, and during the summer, can become too hot for bare feet to touch. Bring with you sandals to wear on the sand or water shoes to avoid burns. Tap water here is not safe to drink. The best way to get around Santorini is on foot or by bus. You’ll see that it’s easy to walk around the tiny seaside towns, but the bus is best to get from one town to another. There are KTEL bus routes from Fira (the capital city) to many different destinations around the main island. KTEL also services the Santorini (Thira) Island National Airport (JTR), but you might find it easier to rely on a cab to get you into town. If you’re planning to do a little island hopping, you can catch a ferry from Athinios (about 5 miles south of Fira).